If there’s one name synonymous with Antwerp, it’s Peter Paul Rubens. The prolific Flemish artist, esteemed diplomat and collector is considered one of the most influential Baroque artists of all time. As a mark of his enduring legacy, his presence is still felt in his home city, and beyond 400 years later. While his highly charged compositions hang in palaces and prestigious galleries across the world, only in Antwerp can you walk in the artists’ footsteps and see many of his finest masterpieces in situ. If you really want to discover the story behind the man who became a cornerstone of Northern Europe’s artistic talent, start your tour in the places he spent the most time: his home and atelier, the many churches adorned with his work and the homes of his friends. An obvious place to start your journey is in Rubenshuis, the home and studio Rubens bought in 1611. The master painter spent most of his life in this grand house, which he used to showcase his work and entertain important dignitaries. Enter the expanse of the magnificent atelier to see with your own eyes the place where the vast majority of Rubens’ oeuvre was masterfully painted, stroke by stroke. The walls are now adorned with some of his greatest works, as well as a stunning self-portrait by Rubens’ protégé Anthony van Dyck. In particular, make sure not to miss Rubens’ self-portrait (one of only four worldwide) which was recently returned after restoration, his early work 'Adam and Eve' and of course the spectacular Renaissance inspired 'The Annunciation'. The building itself is even a reason to visit, featuring a striking Baroque portico and an exquisite formal garden intended to evoke the style of an Italian palazzo – a definite nod to Rubens’ love of Renaissance art and architecture. Stroll down the Meir shopping street to find the striking UNESCO World Heritage cathedral, the tallest Gothic building in the low countries, standing at 123 metres (404 feet) tall. Dominating the skyline of Antwerp since its construction in 1521, the church boasts a massive array of treasures, with major artworks from dozens of painters including four from Rubens. Two of the most breathtaking in the cathedral’s collection are Rubens’ 'Elevation of the Cross' and 'Descent from the Cross'. These two enormous triptych masterpieces give you an idea of Rubens’ talent; his innate ability to capture the energy of the moment and create powerful compositions that inspired the faithful. A short distance from the cathedral, the Plantin-Moretus Museum is where you’ll learn about one of Rubens’ lifelong friends: Balthasar I Moretus. This fascinating building was once a thriving printing dynasty and is now the only UNESCO World Heritage museum in the world. It was thanks to innovative publishers like the Plantin-Moretus family that the 16th century saw the evolution of many new printing techniques that helped to spread the printed word across the world. Christophe Plantin was responsible for establishing the family-run printing business in the 16th century, and later his grandson Balthasar I Moretus would become a childhood friend of Rubens. This close relationship saw Rubens become an avid collector of many beautiful books (which you can see in his library) and sparked a strong interest in publishing. Moretus commissioned from Rubens many of the family portraits displayed around the house and even asked the Baroque painter to provide the illustrations for his prayer book and several others which you can see in this museum. Pass the Grote Markt to seek out this richly Baroque Roman Catholic church, just a few steps from the river Scheldt. Inside St. Paul's Church, visitors are treated to 200 sculptures and more than 50 works by renowned Antwerp masters such as Jordaens, Van Dyck and, of course, Rubens, who has left his own mark with the spectacular 'Adoration of the Shepherds'. A unique feature of this church is the incredible stone statues – known as the 18th century Cavalry – which consists of 60 life-size religious figures that stand outside the church. Follow the tramline until you reach the museum and period town house of the former mayor of Antwerp, Nicolaas Rockox, and another treasure trove of Flemish art. Rockox was a close friend of Rubens and a patron of the arts, collecting many masterpieces and curiosities in his home from various artists that include Rubens, his students and his assistants Anthony van Dyck and Frans Snyders. As well as having a penchant for collecting classic art, Rockox also commissioned Rubens to create a number of pieces, including 'Christ on the Cross' and 'The Virgin in adoration before the Christ Child' which can be seen in this collection. Much like Rubens’ own home, this house is full of fascinating objects, furniture and tapestries from the period. Also, don’t miss out on a chance to wander through the exquisite 17th century city garden where Rockox entertained important guests like Peter Paul Rubens himself! A moment away from Rockox House stands a true Baroque jewel. St. Carolus Borromeus is the church where you’ll find the most influence by Rubens as an architect, painter and decorator – even the intricate façade and steeple are his own work. Dating back to 1615-1621, this Jesuit worship site was once the church to see work by the great artist. At one point there were no less than 43 of his artworks on show. Typically Baroque, the interior is a stark departure from the moody Gothic period, and was lavishly decorated with marble, beautiful sculptures and outstanding art. One particularly unique and extravagant feature of this church is the mechanism created to switch the main altar paintings when necessary. In 1718 a lightning strike hit the church, destroying 39 of Rubens' ceiling paintings. The church has had to wait for over 250 years for a masterpiece by Rubens to return to the church. In 2017, the wait was over. The spectacular 'The Return of the Holy Family' found its home in the Borromeus church. On a quiet street parallel to the Meir, you’ll find the final resting place of Peter Paul Rubens. The late-Gothic marvel, resplendent in marble and with 23 altars, would once have been Rubens’ parish church and stands only 300 metres (330yds) from his home. The great Baroque artist has his own burial chapel here, which is just as ornate as you would expect from his extravagant reputation. Another iconic composition hangs in this chapel, 'Madonna Surrounded by Saints', which Rubens specifically requested to be placed in his tomb. There are also several other works by the painter, as well as Van Dyck and other prominent artists of the day. If you’re short on time and want to see as much of Antwerp as possible, a guided Rubens Walk can be a great way to get up to speed on the life of Rubens and his contemporaries. As you walk through the narrow alleys and cobbled lanes of historic Antwerp you’ll hear fascinating stories about one of the greatest painters in the world and see many of the city’s cultural highlights. For an added bit of fun, you can travel back in time to the 17th century by visiting Rubens Market. Held on 15 August each year in the Grote Markt, the market sees over 200 stallholders all dressed in traditional clothes of the era selling artisan items like bread, cheese and flowers. Surrounded by gabled houses and the stunning city hall, you’ll feel completely immersed in the world of Peter Paul Rubens. You can find more information on Rubens or, if you’re planning to visit Antwerp already, why not check out our guide to making the most out of your visit to Antwerp in 48 hours! 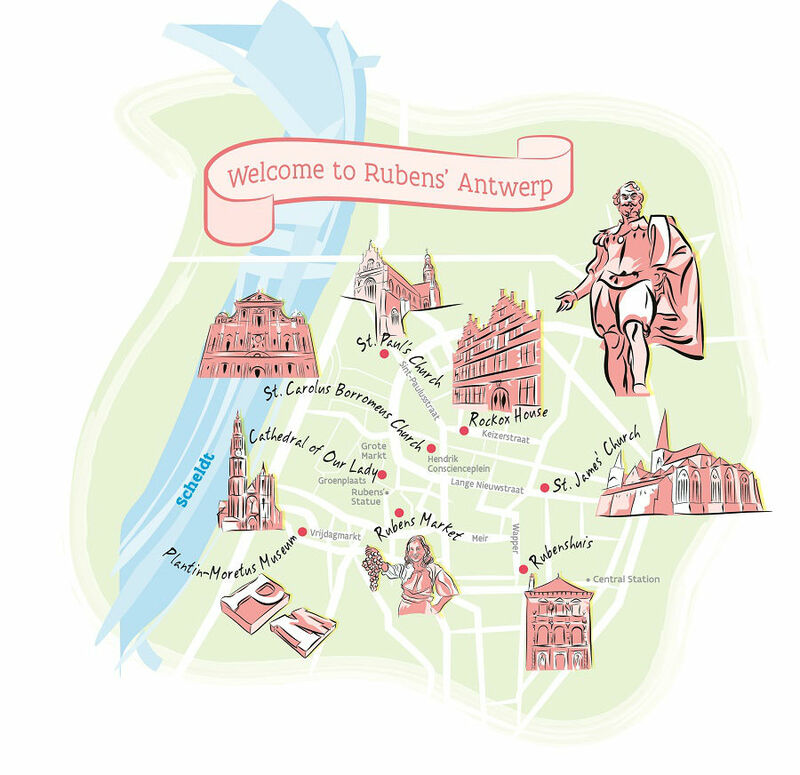 Walk in the footsteps of a Baroque master by using our special map to Rubens' Antwerp.